"Mommy, I really need some quiet time today." "Mommy, I need a bath". O.K, now I'm starting to think something is weird. I tell myself that if he starts asking for green vegetables and a nap, I know I'm losing it. I think the weather has affected him. We had 70 degree weather a few days ago, which turned into pouring rain and hail yesterday, and now it is snowing today. I feel like I've stepped into the twilight zone, although everyone who lives in the Ozarks will tell you, if you don't like the weather - just wait 5 minutes and it will change. Let me tell you, after 10 years of living here I've found this to be absolutely true. What do all of these random things have to do with food you say? Nothing really:) Except that each of these out-of-the-ordinary events led me to make this tasty recipe. 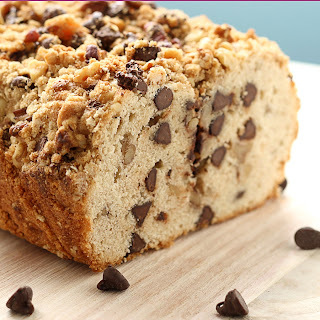 Chocolate Chip Streusel Bread. I have a confession to make. 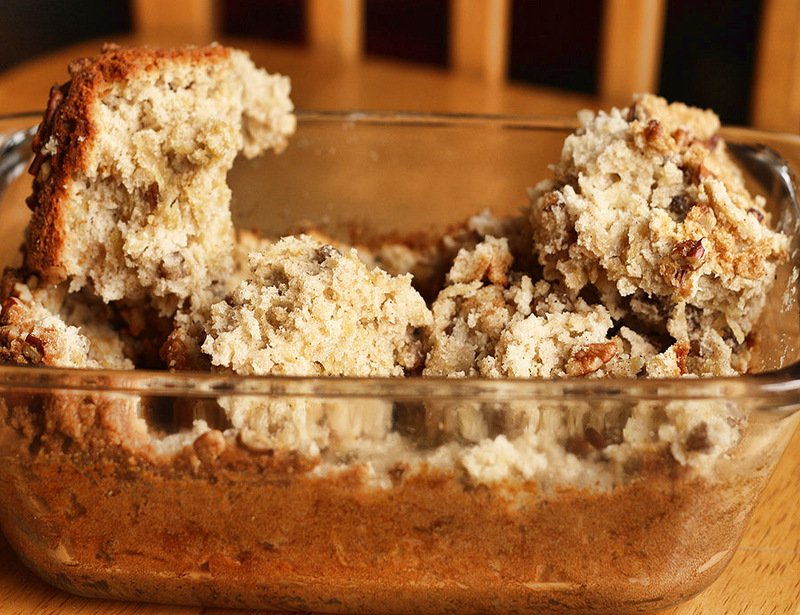 This post actually started out as Apple Pie Bread. However, after putting my loaf in the oven and forgetting about it, I made a mad dash for the kitchen to rescue it, only to dump it upside down on the floor. The result. So, with the patience of a saint, I began working on another loaf. I was so mad at myself for ruining my first bread, that I decided to experiment with the ingredients and came up with this Chocolate Chip Streusel Bread. 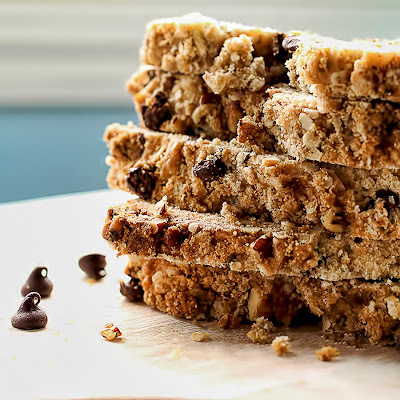 It turned out really good, and I love the combination of the crunchy streusel with the chocolate chip bread. 1. Preheat oven to 350F. Grease a 9x5x3 inch loaf pan. Set aside. 2. In a small bowl, combine the brown sugar and 3 tbsp of flour. Using a fork or your fingers, cut in the butter until mixture resembles coarse crumbs. Stir in the 1/3 cup of chopped nuts. Set aside. 3. In the bowl of an electric mixer, beat the butter on medium-high speed for 30 seconds. Beat in sugar until combined. Add the buttermilk and baking powder; beat until combined. Add the eggs and vanilla; beat until combined. Add the flour, cinnamon and salt; beat until combined. Now stir in the chocolate chips and nuts. 4. Spoon the batter into the greased pan, and spread evenly. Sprinkle the Streusel topping over the batter. 5. Bake for 60 to 65 minutes or until a toothpick inserted near the center comes out clean. Allow to cool in the pan on a wire rack for 10 minutes. Carefully remove from pan, and cool completely on wire rack. I can't decide which bread I'm more excited about, the choc. chip I'm staring out now or the apple pie bread that is yet to come. The choc. chip reminds me of a snack cake my mom used to make, so moist and rich. That's adorable. Special times call for special treats - I need this with my tea! Sorry about your first bread falling on the floor, but the end result does look delicious. I seem to go through stages when I am cooking. I will have a week of forgetting an ingredient, then the next week I will keep burning myself, then I will drop things. What can I say, never a dull moment. Really lovely bread! I'm with your son. I need some time alone, in the bathtub would be good too! Your son sounds like such a character LOL! The bread looks delicious... I love anything with streussel topping... and chocolate! Amazing looking bread! You are sooo creative..I would never thought of putting chocolate chips into the bread! Nicely done!! This bread looks delicious! Love that it is filled with so many chocolate chips. As far as the food, you had me at chocolate. :D Awesome! This bread looks amazing. 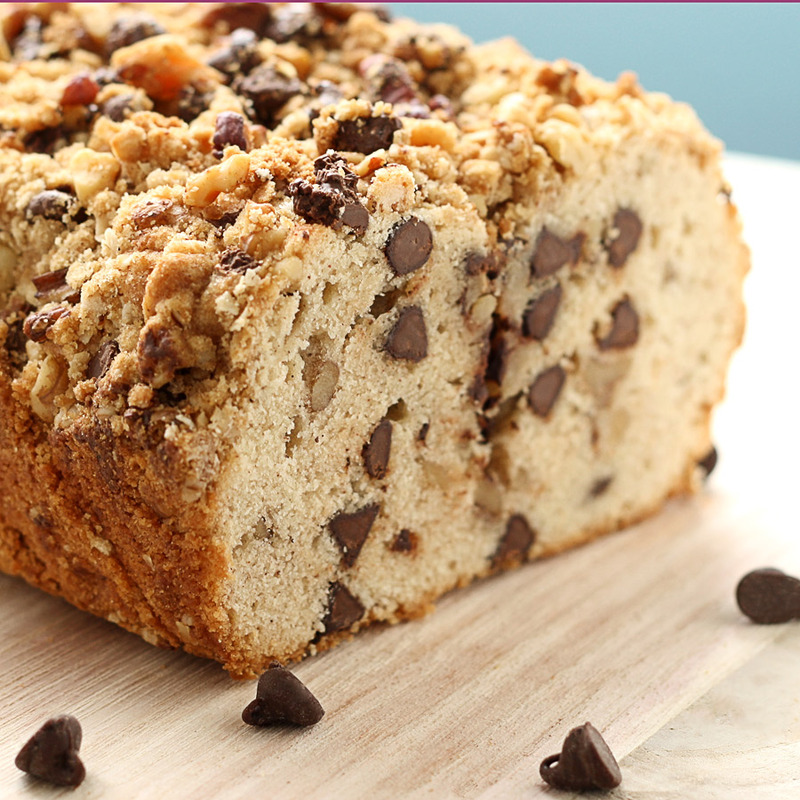 I'm obsessed with streusel breads and am drooling over the thought of chocolate chips and streusel together. I can't wait for your apple pie bread! :) YUM!! I think I might like this bread even better than the apple pie version...but I'm a total sucker for chocolate chips :) I hope the sunshine is back your way soon...I always hated the teases of spring that were followed by winter, again. This bread would cheer me up for sure though! Apple pie bread!! Oh, I can't wait! 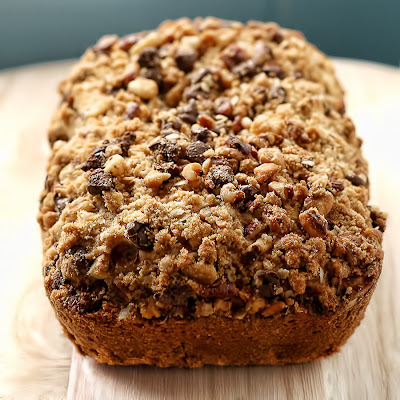 This banana streusel topped bread looks fantastic! My kids would gobble it up:)We make banana bread once a week...I have to try your recipe. Oh how cute is he! LOL! I love kids and their amazing minds. We are dealing with the same insane weather out here, too...my daughter can relate to him. This bread though... mmmm... it sounds fantastic. I love that you did the streusel topping! This bread is right up the BFs ally. Ill have to get in the kitchen and earn me some brownie points. just bookmarked this--LOVE the sound of it! This looks absolutely amazing! YUM!!! This bread looks so delicious! I'm constantly trying to find new dishes to take to our work pitch-ins and I think this would be a hit. P.S. I just stumbled across your blog today, and I think it's my new favorite! I know how frustrating it is to make something only to have it fall apart. Glad your 2nd load came out okay--it looks delicious! chocolate and streusel! win. i love thisssss! i had this and a couple other recipes bookmarked to go back to and just say how much i lovvvvve it! ha, thank you for sharing! Quick question though...is it supposed to be 1/2 cup of milk or buttermilk? Hi Larisa! Yes, this recipe does use buttermilk, although you could easily substitute regular milk if you wanted to. I'm assuming when it says 1/2 milk buttermilk, it means 1/2 cup?